Is your solution design reference up-to-date? Is it reliable? Has it even been created? A solution design reference (SDR) is a dynamic document that serves as a catalog of all variables, props and eVars implemented on a site, along with their corresponding metrics and expected values. Sometimes called a site plan, a tag plan or a variable map, this document is essentially a blueprint of the analytics implementations across your organization’s digital properties. It’s an important piece of documentation, a key part of your data governance strategy. And yet, it is rarely consistently made and maintained by analytics teams. Adam and Pat will highlight some common errors that they have seen in the creation and application of SDRs—all of which can put your organization at risk for data loss, leakage, inflation and general confusion. 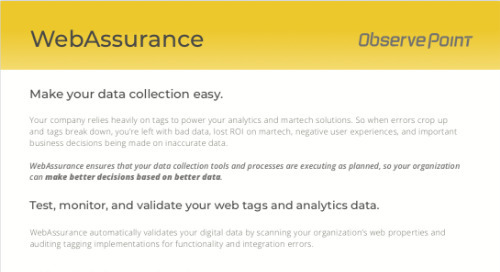 Along with valuable insights into data governance best practices, Pat will also be presenting a free, automated tool—the Digital SDR—developed by ObservePoint LABS to help your business better govern your data. Join us for this free webinar so that you can avoid some common pitfalls and apply data governance best practices.